Thirty years ago, on March 22, 1987 a nine-alarm fire ravaged and destroyed Building 7 of the Lawrence Mills Complex along the Merrimack River in Lowell, MA, causing $7 million in damage (in 1987 dollars). At the time of the fire, Classic Elite Yarns was known as Elite Speciality Yarns and was housed in the mill complex in the Hub Hosiery Building across a narrow street from Building 7. The two buildings were connected by a second floor catwalk which became engulfed in flames. Firefighters poured enough water on the catwalk to keep the flames from Hub Hosiery and Classic Elite! Jim Doyle, Classic Elite's Credit Manager and Buyer has been with the company for 33 years. His memories of the fire and their impact on CEY and its employees are vivid. Here's a bit of my conversation with Jim about that week back in 1987. The alarm was called in by an off duty firefighter at about 5:40 PM. I was home having dinner and was either listening to the radio or watching TV when they broke in with a bulletin noting that there was a major mill fire in Lowell. 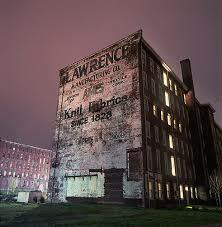 I got in my car, not knowing exactly where the fire was, as Lowell is full of mill buildings. I lived about four miles from work and when I got on the highway I could tell from where the smoke was emanating that there was a chance the fire was nearby our offices and mill. Our building was saved, but everything on the two floors we occupied was wet, all of our inventory, mill machinery, and the office area. If memory serves we just went about cleaning up with the help of service master crews and then getting hold of vendors to see what they could do to get fresh stock to us ASAP. At that time we had many more domestic vendors than we do now, and most were able to work with us to get back up and running. The impact was that about 200 plus people were not as lucky as we were and their businesses were devastated. Several were never able to open again. We were very lucky, and as is the case many times in situations like this, we just rolled up our sleeves and got to the business of cleaning up and getting up to speed as quickly as possible. I can remember on the first anniversary of the fire we had a “Feast of the Fire” lunch. We all wore plastic kiddie fire helmets and had several from the fire department drop by and share cake, and shared stories of that day, that I for one will never forget.